If a student is unable to access ANY grades (ie. the Grades link is unavailable to them), it is likely that the setting to show the gradebook to students has been disabled. 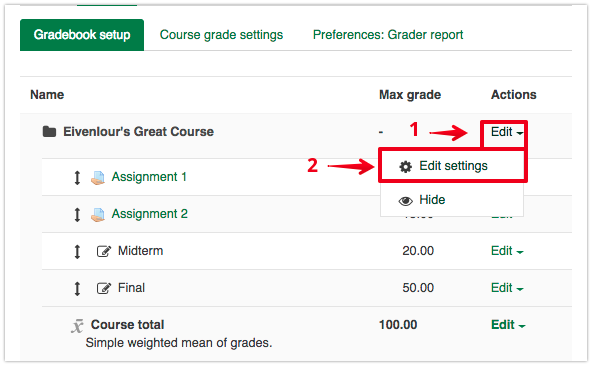 To enable student access to the gradebook, click on the gear icon from your course main page, then click on Edit settings. Next, on the Edit course settings page, scroll down to the item 'Show students their own grades' (under the Appearance heading), and change the value to Yes. 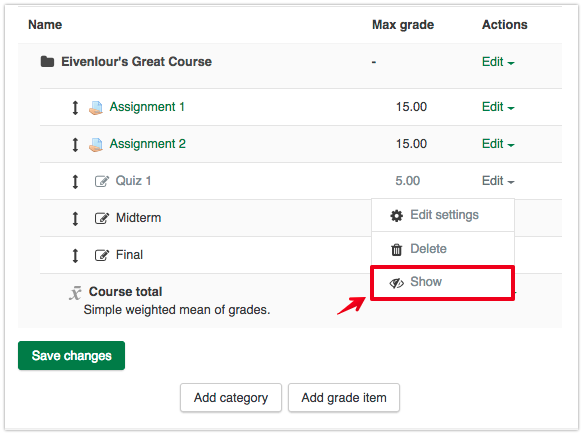 Note that it is standard procedure for learning management systems to show students only their assigned grades. By showing students the gradebook, you are not granting students access to their classmates’ grades. By default the course total grade is hidden from students. To allow students to see their overall grade in the course, you must turn it on. 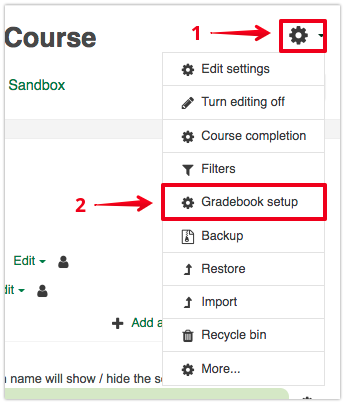 Once you are on the Grade administration page, make sure you are in the Gradebook setup tab, under the Setup tab. Click on Edit > Edit settings beside your course's name. 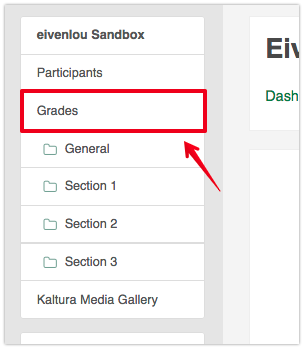 Here you can set the grade type and the Grade display type, which is what students see in their gradebook. 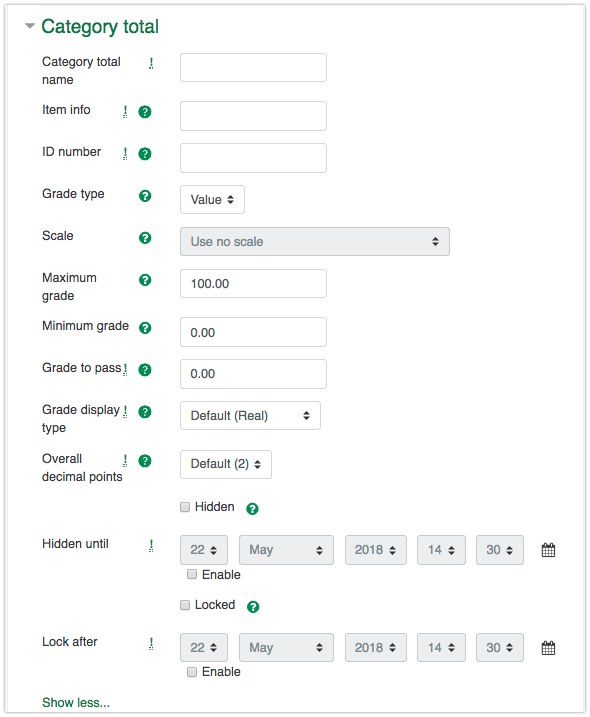 If students can access the gradebook, but cannot see a specific grade item, this may be because that item is currently hidden from students in the gradebook. To show these items, click on the Gradebook setup tab under the heading Setup tab. Find the affected grade item on the page, and check the icons in the dialog after clicking on Edit. If you see an icon of a closed eye, this means that that item is currently hidden to students. Hidden items are displayed to the instructor with greyed out text, as shown below. To show this item to students, click on the closed eye icon to ‘Show’ it.